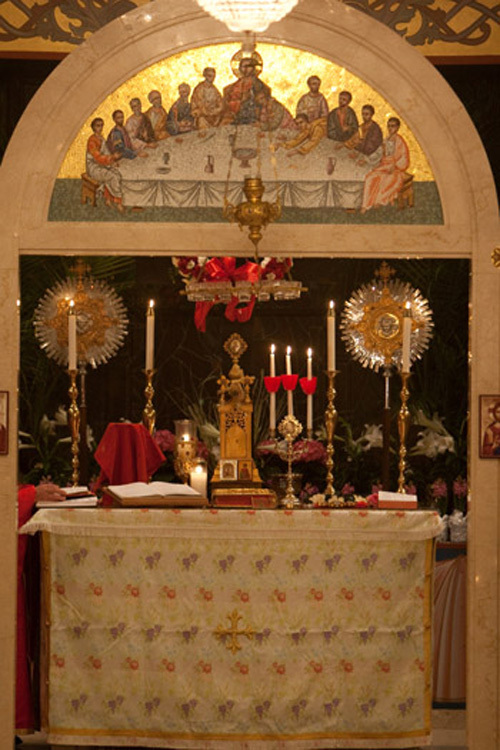 A tabernacle, where the bread and wine are stored before and after consecration and communion. A crucifix, either hanging on a wall inside, depicted in a painting, or outside the church. Decorations in Byzantine art, as compared to the naturalistic art more often used in Western churches. Icons - pictures of Jesus, Mary, or saints associated with the church. Iconostas (Icon Screen) - found in both Eastern Catholic and Eastern Orthodox churches, the iconostas is the meeting of the earthly (the nave) and the heavenly (the altar). Three types of doors make up part of the iconostas: the north and south Deacon's Doors, used by the priests and deacons as an entrance and exit, respectively, during the Divine Liturgy; and the Royal Doors in the center, which is used only by the priest, and only at certain times in the Divine Liturgy. The iconostas is usually made up of three tiers, although sometimes, only two tiers are used. On the first tier are usually St. Nicholas, Patron of the Eastern Church; an icon of St. Michael the Archangel; the Virgin Mary with Baby Jesus; the Royal Doors, depicting the Annunciation; Christ the Teacher; St. Stephen, the first Christian martyr; and the Patron(s) of the particular parish, although the order may vary. The second tier depicts the twelve major feast days in the Eastern Church, with an icon of the Mystical Supper in the center. The third tier, if there is one, shows the twelve apostles. If there isn't a third tier, the apostles are usually painted or shown somewhere else above the altar. Votive candles - candles found by an icon. People light the candles as a prayer for someone, or in memory of someone. The candle serves as a visual reminder of the prayer or memory. There may be kneelers in the pews, but they are only used for services during Lent, following the directive of the First Ecumenical Council that kneeling is prohibited on Sundays, since it should be a time for joy. Many of the more traditional churches may not even have pews, so that parishioners stand through the entire Divine Liturgy. Additionally, with the exception of the Eucharistic Prayer and the homily, the entire Divine Liturgy is either intoned or sung. Traditional Eastern Orthodox churches are very elaborately decorated inside. They utilize gold, silver, and ornate mosaics, done in the style of icon painting, to decorate the church interior, evoking a feeling of grandeur. They are stylized after the Temple in Jerusalem and the celestial liturgy described by the Apostle John in the Book of Revelations. The most distinctive characteristic of Eastern churches is their use of domes, instead of steeples. 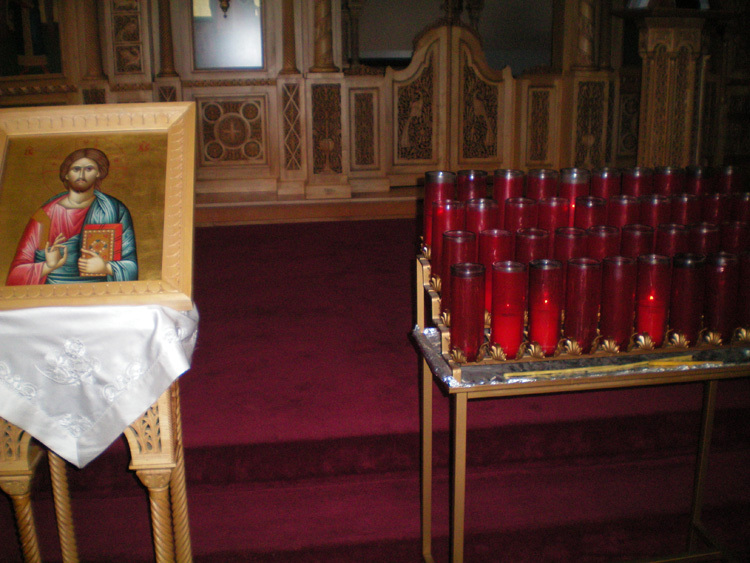 This can be seen in many Eastern Catholic churches, but they have become a defining feature of many Eastern Orthodox churches. There are several explanations of what these domes mean. One says that these domes are meant to gather or collect the goodness from Heaven, while another explanation is that they are meant to show the outpouring of the Holy Spirit upon the Church. The domes also come in different forms. The onion dome is the most common, where the diameter of the dome is wider than the base it sits on. Helmet domes are widest at the base. Bud domes are similar to onion domes, but are smaller, and are longer and narrower at the top. 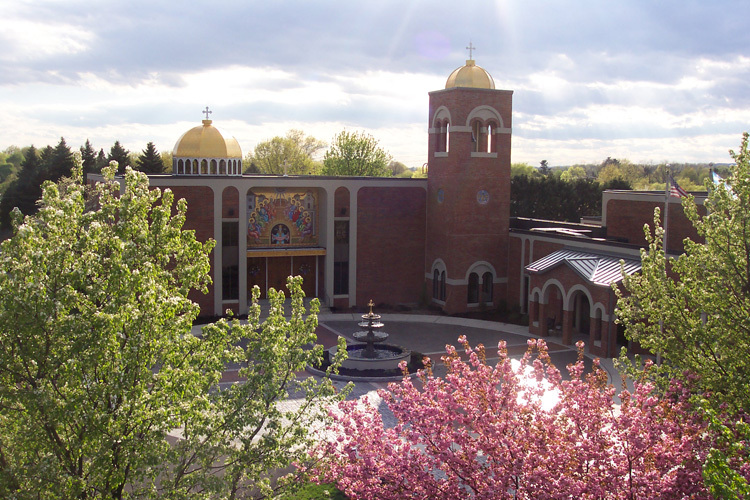 The congregation of the church formed over several years, beginning in the early 20th century, but it was officially recognized by the Archdiocese in 1937. However, they did not have a permanent building until 1946. By the late 1960s, however, increasing numbers meant the church needed a new building. The present structure was begun in 1968 and officially opened in 1970. In 1981, it was consecrated as a cathedral. Most of the original congregation came from the Greek island of Icaria. After forming the Icarian Brotherhood of America, a charitable organization and means of support for its members, they still had no local place of worship. The church was chartered in 1922, after which the diocese began sending visiting priests. The first priest built a temporary altar, and parishioners raised money to rent a space above a market by going door to door. Before and during World War II, money was collected to build a church, and in 1950, the congregation was able to purchase the present site and build their own church. The interior of Holy Trinity Greek Orthodox Cathedral. The iconostas at Holy Trinity Greek Orthodox Cathedral in Camp Hill. 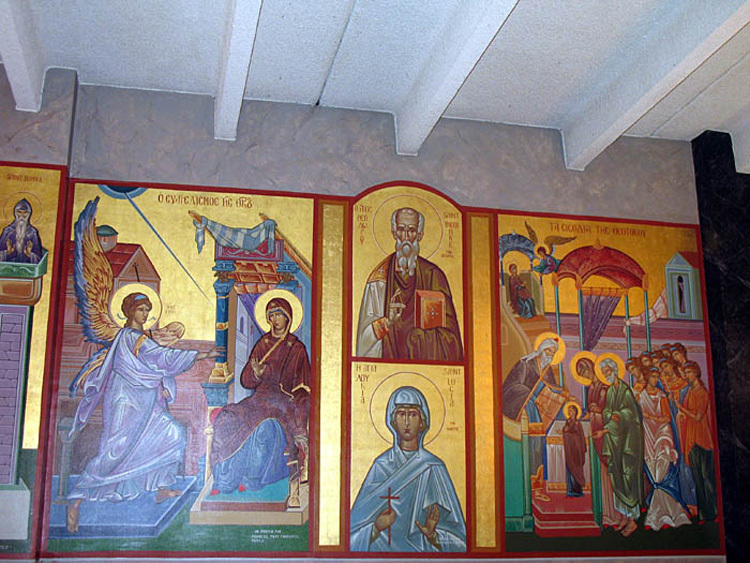 A section of the iconostas at Holy Trinity Greek Orthodox Cathedral. Votive candles next to an icon at Holy Trinity Greek Orthodox Cathedral. A wall of icons in Byzantine art, depicting the Annunciation and various saints. The altar, known as the Holy of Holies, at Dormition of the Theotokos Greek Orthodox Church in Oakmont.